We need to be clear about what the real danger is not just for the Philippines, but the region and the world. Attending the Shangri-La Dialogue in Singapore last month, it was virtually impossible to have a conversation about Southeast Asian affairs without a reference to the now newly inaugurated Philippine President Rodrigo Duterte and the extent to which his foreign policy approach might depart from that of Benigno Aquino III. Unsurprisingly, the main area of interest in this regard was Duterte’s approach to China and the South China Sea, which will be important to watch in the following weeks after the verdict issued by the Hague-based Permanent Court of Arbitration (PCA) on July 12. Yet despite the flood of recent commentaries about Duterte’s approach towards China and the South China Sea – which, let’s be clear, has yet to take shape beyond a series of offhand comments and nascent policy proposals – few have sought to delve deeply into what he could actually do and what the implications might be. After some in-depth conversations both in the region and in Washington, D.C., I’ve published a long piece in Rappler that attempts to do just that. In that piece, I argue that the danger is not that Duterte will open bilateral talks with Beijing on the South China Sea or undertake major foreign policy realignments like moving the Philippines closer to China, contrary to what some have argued. As seasoned observers of Philippine foreign policy know, even members of the former Aquino administration – including his foreign secretary Albert del Rosario – have made clear that Manila had pursued the PCA case in response to China’s unlawful assertiveness, but always left open the possibility of future talks with Beijing following the verdict. As for the fear about Duterte moving closer to China, every Southeast Asian state is trying to pursue good ties with China to varying degrees in spite of concerns about its rise, so we should not be surprised that new leaders in the region will try to explore that possibility. Furthermore, despite Duterte’s tough talk, we should not lose focus of the fact that structural factors – including popular opinion and the Philippines’ weak military – as well as the actions of major powers themselves, condition Manila’s alignments and will constrain attempts by leaders to suddenly veer in one direction or another. The real risks of Duterte’s approach towards China and the South China Sea, then, lie not in whether he talks to China or moves the Philippines closer to Beijing than under Aquino, but how he does so. Specifically, the true danger of Duterte’s approach to China and the South China Sea is that his administration will seek to engage Beijing in a way that not only undermines Philippine interests in terms of its relationship with China, but undercuts the regional unity and global solidarity needed to constrain Chinese assertiveness in the South China Sea. The piece details the risks in the bilateral, regional and global contexts, and they are worth summarizing briefly here so we can get a full picture. Bilaterally, the risk is that Duterte will approach China and the South China Sea in a way that undermines Philippine interests, including through policy missteps that reduce the country’s leverage vis-à-vis Beijing or policy approaches that are more favorable to China than they are to the Philippines. On the first count, by sending out overly positive signals to China before the verdict – including a desire to pursue joint development, accept Chinese infrastructure projects, downplay the PCA case, avoid military actions, and adopt a more lukewarm stance towards the United States – Duterte has already arguably undermined the Philippine position by signaling he is leaning in the direction of concessions without being clear about the conditions for them to occur or any idea as to how strong Manila’s hand will be after the ruling. This can lead China to overestimate its position and underestimate that of the Philippines, affecting the extent to which Beijing is willing to compromise in any negotiation. Though less probable, the other possible risk is that Duterte’s initial outreach to China translates into an overly narrow economics-first approach towards Sino-Philippine relations on terms more favorable to Beijing than Manila. Such an approach would see both sides not only boost economic ties but also conclude suspicious infrastructure projects and perhaps even questionable joint development arrangements while shelving the South China Sea dispute. As Philippine watchers know, joint development in particular has a bad name in the country as it is associated with the approach taken by Aquino’s predecessor Gloria Macapagal Arroyo. At the time, a controversial joint development deal in the South China Sea inimical to Manila’s interests was cut with Beijing in exchange for Chinese-backed infrastructure projects, which ended up being embroiled in one of the largest corruption scandals in Philippine history. It is not unreasonable to expect that this could end up being a source of domestic opposition to Duterte in addition to a number of other fronts where he may challenge the established elite. Duterte’s approach could have consequences beyond the Philippines as well. Regionally, Duterte’s position on China and the South China Sea also risks undermining ASEAN unity and centrality, not just after the PCA verdict but further out if Beijing continues its attempts to divide the regional grouping. Over the past few years, the Philippines has been by far the most forward-leaning of the four Southeast Asian claimants on the South China Sea issue, which is important not just for its own sake but also within the context of ASEAN since this helps provide ‘cover’ for interested parties who are not claimants (like Singapore) to call for more aggressive action and pushes back against laggards (most notably Cambodia). If the Philippines suddenly adopts a much softer line on China and the South China Sea, it could see other Southeast Asian states also adopt a softer line, either because this is in line with their own traditional preference to downplay the issue or because they find it diplomatically difficult to get ahead of ASEAN’s most-forward-leaning claimant. That will not bode well for ASEAN, which is already facing a challenging year on the South China Sea issue with the triple challenges of grappling with the fallout from the PCA decision, managing the ASEAN-China relationship during the 25th anniversary of the establishment of the dialogue partnership; and being led by Laos, a landlocked country with little interest in the South China Sea and a lot invested in its relationship with China. One critical early test of how Duterte’s approach feeds into regional outcomes will be during the next round of ASEAN summitry from 21-25 July, just days after the PCA verdict, where the world will be watching to see if ASEAN can issue a separate statement on this important decision, as many ASEAN advocates hope, as opposed to a standard communique (or, perhaps, not even that). But the role of the Philippines will be important further out as well. As the Philippines officially assumes the rotating annual ASEAN chairmanship which Laos holds in 2017, it will give Manila an additional opportunity to affect regional outcomes on the South China Sea amongst other issues. As ASEAN chair, Manila will likely be subject to the routine mix of charm and pressure from Beijing in the lead up to and during its chairmanship, and it will be interesting to see how that plays out. Globally, the risk is that Duterte’s approach undermines ongoing international efforts designed to counter Beijing’s assertiveness. Though China has gained in some ways from its South China Sea actions, in reality Beijing’s behavior has also led regional states to strengthen their ties with other powers and prompted other countries to take an interest in the issue, helping knit together an ever-widening group of concerned global actors who are willing to stand against Chinese transgressions and for the rules-based international order. But the strength of this group – which U.S. Defense Secretary Ash Carter has called a ‘principled security network,’ is partly derived from the contributions of claimant states like the Philippines, which is important not just in terms of capabilities, but how actions are calibrated. Indeed, without Manila’s role in recent years – be it filing the case or inking a new defense pact with Washington to give it access to strategic military facilities in the Philippines – this global effort would not be nearly as strong as it is today. A pullback by Manila on its stance towards China and the South China Sea under Duterte – especially if done in a sudden and unjustified manner – could undercut the emergence of such a global coalition. While there are several ways this could occur, two are particularly notable. First and most obviously, without Philippine activism, other interested states may have to either scale down their words and actions or risk bolstering the Chinese claim that ‘outside actors’ are stirring up trouble in the South China Sea even though Beijing is patching things up with Manila. Second, it would send a dangerous message to some in Beijing about how a rising power conducts itself in the international system. 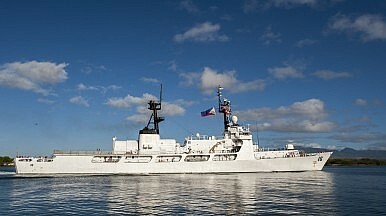 Given the extent of Chinese assertiveness directed at the Philippines in recent years and the threats they have posed not only to Manila’s interests but also the rules-based international order more generally, simply wiping the slate clean would reinforce the thinking of more hawkish voices in Beijing that while China’s South China Sea actions may lead it to incur some short-term costs, its military and economic might means it can simply absorb them for a while and then look to recover its losses by charming those it had previously coerced. If Chinese policymakers are convinced that this is the case, the conclusion that could follow from that is that the key for Beijing is not abiding by the rules-based international order like most countries would like it to, but calibrating its opportunistic efforts to reshape and even defy it through alternating periods of coercion and charm to balance attendant costs and benefits. This is just a short summary of the much longer piece, and I’d encourage you to read the full thing here. The bottom line, though, is that we need a more detailed and nuanced conversation about the real risks that Duterte’s approach towards China and the South China Sea poses not just for the Philippines, but for the region and the world as well. Simplistic assessments misstate and in some ways underestimate these risks. And as I conclude in the piece, scholars, experts, and policymakers, including Duterte and his advisers, would do well to grasp the full picture of the costs and benefits of various approaches before taking steps that could ultimately prove misguided. The foreign secretary says Manila will move forward with official talks with Beijing.